Performers include: Jason Wiles, Coby Bell, Anthony Ruivivar, Skipp Sudduth, Molly Price, Michael Beach, Kim Raver, Alyxx Morgen, Eddie Cibrian, Joe Lisi, John Michael Bolger, Bill Walsh, Tia Texada, Chris Bauer, Amy Carlson, Derek Kelly, Nia Long, Bonnie Dennison, Bobby Cannavale, Saundra McClain, Yvonne Jung, Jeremy Bergman, Cara Buono, Darien Sills-Evans, Joseph Badalucco Jr., Savannah Haske, Josh Stewart, Lisa Vidal, Kristopher Scott Fiedel, Patti D’Arbanville, Sakina Jaffrey, Monica Trombetta, Nick Sandow, and Susan Kelechi Watson. This drama focuses on the emergency personnel – police officers, firefighters, and paramedics – working in a fictional precinct and fire station who work the late night shift between three and eleven at night. These personnel refer to the area where they work as “Camelot,” due to the fact the police and fire stations were on the corner of King Blvd. and Arthur St. in New York City. Originally the show was meant to only be about police officers and paramedics, but when Eddie Cibrian auditioned for the role of police officer Maurice “Bosco” Boscorelli, producers gave the role to Jason Wiles and added a part for Cibrian as a firefighter. Bosco can be quite cocky and isn’t one who enjoys taking orders. If there’s trouble out there, he makes it his job to find it. Bosco is somewhat of a lothario, bedding several different women throughout the show, but always has a platonic relationship with Faith Yokas, his best friend and partner. Faith (Molly Price) is the daughter of an alcoholic, and when her husband Fred (Chris Bauer) takes up the same habit, she stops him dead in his tracks. She became a cop after their two children, Emily and Charlie, were born. Even though it brings the family more money, Fred is very resentful of her job. He dislikes the time his wife spends away from the family, is constantly worried about her safety, and also resents the time she spends with Bosco. When she gets pregnant, Faith gets an abortion, but tells Fred that she miscarried. John “Sully” Sullivan (Skipp Sudduth) trained in the police department under officer Tyrone Davis, Sr., and they eventually became partners. Tyrone was a dirty cop, who planned on turning the other dirty cops in, but was set up and murdered and this dramatically changed Sully. He was a lonely bachelor for awhile, until he met his Ukranian neighbor, Tatiana. He marries her and eventually finds out she has connections to the Russian mob, the same group that eventually has her killed. This results in Sully becoming an alcoholic, and it’s his fellow officers who finally force him to face his problems and dry out. Sully gets a new partner on the force, and it’s none other than Tyrone Davis, Jr. (Coby Bell), who starts out with Sully as a green rookie. He disagrees with Sully’s style. Ty sees their job as strictly black and white – right and wrong, while Sully believes that they’re just solving problems. Finding out that his father was a corrupt cop upsets him a great deal, as he became a cop to uphold justice just like his father. Ty also finds out that his father had led a double life with two separate families. His style also contrasts with fellow officer Sasha Monroe who he starts dating, and they manage to work through it after she’s exposed as a mole. Carlos’ boss and mentor is Monte “Doc” Parker (Michael Beach), a widower who accidentally killed his best friend when he was younger. After his partner was shot and took an early retirement, he got partnered up with Carlos. Doc uses his paramedic skills to “help” his father die when his quality of life slipped away. A series of bad events began to gnaw away at Doc, starting with 9/11, then being filmed making an obvious medical mistake after just winning Paramedic of the Year. He then witnesses the death of some of his coworkers. Once a new captain is assigned to replace Jimmy Doherty, Doc completely loses it, shoots him, and gets assigned to Bellevue. Jimmy Doherty (Cibrian), a firefighter, was once married to Kim Zambrano (Kim Raver), a paramedic, and they have a son together. Jimmy slept with Kim’s sister, causing her to divorce him. Yet, he’s never completely out of her life because of their shared custody and they see each other at the firehouse. Jimmy seems to have a hard time getting past her as well. He becomes engaged to another woman, but was caught cheating on her at their engagement party. After he remarries, he has an affair with Kim, and he gets divorced again. Eventually Jimmy and Kim find their way back to each other, move away from the precinct and remarry. Kim’s partner and best friend is Roberto “Bobby” Caffey (Bobby Cannavale). He also has a crush on her, giving him a hatred for anything Jimmy Doherty-related. His father abandoned the family when he was young, and as the most responsible of his siblings, he became the man of the family. Bobby eventually realizes his dream, sleeping with Kim. The next day however, she tells him it was a mistake because she doesn’t want anything to come between their friendship. An old childhood friend returns to the neighborhood, and Bobby tries to help him overcome his drug addiction but then the friend robs Bobby’s mom’s apartment to get money to buy drugs. Bobby confronts him, and his friend shoots and kills him, causing Kim to fall deeply into a depression and attempt suicide. BEST copdrama ever after hill st blues,( yes, I’m old)! Use all appropriate positive adjectives to describe cast and storyline. BEST handling of 9/11 by any other show. Dittos to all my friends who’ve asked same I’ve asked about reruns and DVDs!!! Don’t get it BUT all these available channels I should b fed on regular basis Kardashians, housewives from anywhere, etc etc, but some programming genius sees no room for replaying the BEST police drama? So sez I. Third Watch to this day is still my favorite tv show ever. Nothing comes close. I wish they would put all the seasons out on DVD. I have so many favorite episodes. I agree. Best show of its kind. BRING IT BACK!!!!!!!!!! hope CHICAGO FIRE can measure up to THIRD WATCH! Maybe someday those writers will bring it back!! They should have not cancelled Third Watch, its the best TV show in history, I’ve lost apart of me, not a day goes by that I don’t think about Third Watch. Why did they cancel it when the ratings were soooooo good!!!! They also should make a movie it will be good. I agree. Third Watch was a very good series. And when I look at current series on offer and compare, none can. I agree with the other comments. I still believe it was the best show of its kind ever, bar none. I just started watching Chicago code and have found it very similar in excitement, but just found out it will be canceled and not brought back for a second seasen. This is upsetting due to the fact it has been six years since Third Watch and finally a show that comes close and they cancel it. I don’t understand. 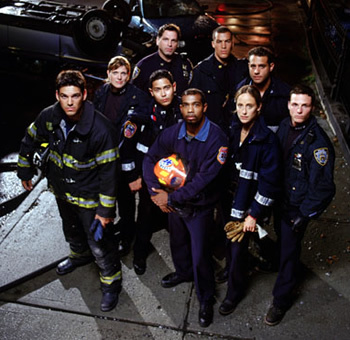 I’d have to say that Third Watch is one of the BEST if not THE best “First Responder-related” tv shows ever created. Hands down! Third Watch was and still is the very best tv series ever, nothing will beat it ever. I miss you every single day its so sad that I just watch the dvds over and over again. Thanks to all the cast and crew for bringing us what would have been the best police/fire/paramedic show on earth.